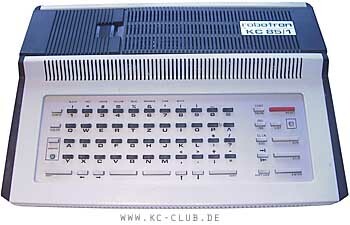 The KC85/1 was originally introduced as the HC-9001, "HC" meaning "Home Computer". But as the industry demand for computers was so high, they even used these home computers, so the name was changed to KC85/1, "KC" standing for "KleinComputer", which could be translated to "Small Computer". The machine had very limited graphical capabilities with 128 pre-defined graphic and 96 text symbols in text mode (8x8 pixels size). The BASIC language needs to be loaded from cassette every time you needed it (or you could also get it as an optional ROM Module). It has got an awful keyboard (3 x 10 mm plastic keys), which was quite a pain to type with for a long time. There was probably no real reason to prefer it from the other available models, except its low price, compared to its bigger and more featured brothers. Info kindly provided by Stefan Goehler. RAM 17 KB (16 KB free), expandable to 64 KB max. see more Robotron KC 85/1 - Z 9001 Ebay auctions !